On June 9, 1993 the Kansas City Chiefs signed 33-year-old free agent RB Marcus Allen to three one-year contracts. Allen joined another established veteran, QB Joe Montana, who had come to the Chiefs via trade from the 49ers earlier in the offseason. Allen had played 11 seasons for the Los Angeles Raiders and was ranked 12th on the NFL’s all-time rushing list following the ’92 season. Having won the Heisman Trophy at USC in 1981, he was taken by the Raiders, newly moved from Oakland to LA, in the first round of the NFL draft and led the league in yards from scrimmage (1098) and rushing touchdowns (11) in the strike-shortened ’82 season. When the Raiders won the Super Bowl following the 1983 season, Allen was the game’s MVP with a then-record 191 yards rushing, and in the four seasons from 1984 through ’87 he was selected to the Pro Bowl. He also received MVP honors in 1985 as he led the NFL with 1759 rushing yards and caught 67 passes for 555 more yards, adding up to a league-leading total of 2314 yards from scrimmage. A versatile back who excelled both at running the ball and catching it out of the backfield, the 6’2”, 210-pound Allen had been one of pro football’s best backs in his first six seasons. But beginning with the arrival of RB Bo Jackson in 1987, who split his time between major league baseball and pro football, Allen became less of a factor in the Raiders’ offense. To be sure, injuries played a role in Allen’s decline, but even after Jackson’s career came to an end in the 1990 postseason, he found himself backing up other running backs (including over-the-hill former stars Roger Craig and Eric Dickerson) due to a bitter feud with LA’s managing general partner, Al Davis. In 1991 and ’92, he carried the ball just 130 times and publicly accused Davis of trying to wreck his career. In a parting shot after the season, Davis referred to Allen as an “asterisk” in Raiders history. The Chiefs had become a revitalized franchise with the arrival of President/GM Carl Peterson and Head Coach Marty Schottenheimer in 1989. 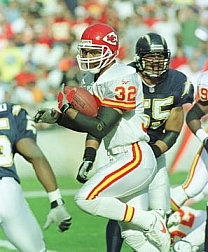 Having had just two winning seasons and one postseason appearance in the 14 years between the end of the Hank Stram coaching era and the arrival of Peterson and Schottenheimer, Kansas City had put together four straight winning records and three consecutive trips to the playoffs from ’89 through 1992. However, the Chiefs had yet to make it beyond the Divisional playoff round, and it was hoped that adding the two accomplished veterans would get the team deeper into the postseason. Allen proved during the 1993 season that he did indeed have something left. When young RB Harvey Williams had difficulties in the early going, the savvy veteran moved into the starting lineup and rushed for 764 yards on 206 carries (both figures his most since the ’88 season) and caught 34 passes for another 238 yards. He tied for the AFC lead with 15 touchdowns and led the entire NFL in rushing TDs with 12. It earned Allen selection to the Pro Bowl for the first time in six years. While he might have lost a step, he was still a solid all-around back and fit well in Kansas City’s offense. With Montana and Allen in the lineup the Chiefs won the AFC West in ’93 with an 11-5 record and advanced to the conference title game before losing to Buffalo. That would prove to be the postseason high-water mark for Kansas City during the period in which Montana, who retired following the 1994 season, and Allen were with the club. In all, Allen played another four seasons for the Chiefs, rushing for a total of 3698 yards (of a career total 12,243) with a high of 890 in 1995 and pulling in 141 catches for 1153 yards (he retired with 587 receptions, the most for a running back up to that time). Even as a backup in 1997, his last year at age 37, he still rushed for 11 touchdowns, giving him a career total of 145 (123 by rushing). While there were no Super Bowl appearances, Kansas City did make it to the playoffs in three of those four years (four of five overall). It was also no doubt satisfying for Allen that the Chiefs posted a 9-1 record against the Raiders during his tenure with the team. As a footnote, Marcus Allen was ultimately enshrined in the Pro Football Hall of Fame, part of the Class of 2003.